What’s common between a mobile services provider and Tigers in India? Only a month ago, 1411 was just another number without much significance attached to it. Now, almost everyone who watches television even moderately would say that, 1411 is the number of tigers left in India. Thanks to the massive media campaign from Aircel. For those minority who are not aware of this campaign, let me brief it here in a few words. Save-our-tigers is a massive media campaign by Aircel to make people aware of the extinction of Tigers and there are only 1411 tigers left in India as of now according to their statistics. They have created a website where people like us can pledge our support. Yes, it helped the average Indian to know that Tigers are at the verge of facing extinction in India. Not to forget, Tiger is our national animal. My whole point in writing this blog post is not to make you aware of this campaign. For that matter, I think most of the average netizens in India are already bombarded with ads and chain mails about this issue. Frankly, I really do not understand how am I going to save tigers just by writing a blog post, or updating my Facebook status message, or ‘roaring online’, or twittering. I am not kidding. I seriously do not understand how this is going to help save the tigers, and let alone increase the count. If you have any idea, please do tell me. I can safely say I do not know anyone who uses Facebook and killed a tiger in his life. So, asking an average Indian to save them is almost useless. And how about asking an average Indian to tell police when you come to know about tiger-hunters. Come on… are you joking, I ask them. Imagine yourself going to a police station or calling a helpline to tell that you know someone who hunted a tiger. I do not see this as practical. Not for a common Indian like me. Brand-building through campaigns/advertisements with a social issue around them seems to be the new age marketing mantra. Of course, there is no harm in doing that. But I really hate when my inbox gets filled with such forwarded stuff and when I get an SMS asking me to save tigers. Especially when my phone buzzes in the middle of an afternoon nap. Come on… I am not a tiger hunter. Not even in my wildest dreams. If we really have to support, we must actually help people like the following kid. Of course, I came to know about this kid from this campaign’s website. If there is something the government can do, is to really take steps to increase the count of the tigers. But how? Hey… can’t they just bring a few male and female tigers together in a dedicated zoo for them? And I am sure they know what to do. They do not need our help. Nature takes care! When there are enough new tigers, they can be left on their own in the tiger reserves. But, I am no ecologist though. My point is not to criticize or dismiss such campaigns. It’s just that I really do not understand how they are going to really help the cause practically. And being aware of something really doesn’t always help to solve the problem. Being aware about AIDS is no good when we actually don’t practice safe s_x! I know this isn’t a good analogy, but I hope it helped me to convey my thoughts. And may be this campaign was actually started with a good intention with no commercial interest. Who knows. Now Aircel guys, don’t sue me for writing this blog post. I have nothing against you. Between, I have an Aircel connection even before you started this campaign. PS: I wonder how they have come up with the number 1411. I mean how can we really count tigers? And did they count all Tollywood heroes who say they are tigers in every other movie. This entry was posted in: IndiaBookmark the permalink. Post a comment or leave a trackback: Trackback URL. Nice post dude….even I was wondering how an oridinary person can help save the tigers..
Btw Balayya should be appointed as the forest officer, only he can run faster than a bullet or even chew it else Vijayakanth coz all the bullets fired against him will be recotiated and the goondas will die. In this case, the hunter will be dead. LOL!! You articulate my unspoken thoughts. Must confess I ignore the ‘invites’ and the ads. because I too don’t understand the point of this ‘Save Tiger’ campaign on TV and social media. Besides, aren’t messages they send out smack of ‘Herculean’ effort to preach to the converted ? To my mind, saving tigers – protecting wildlife for that matter – is about strengthening surveillance to prevent poaching. Wonder if the Tiger reserves can be brought under 24×7 satellite scanning. Maybe Aircel and other corporates could chip in to meet the cost. They can also sponsor publication of illustrated children books – with lots of tiger stories – to be distributed free among our school children. Tiger paintings competitions can be sponsored. Vulnerable population living on the fringe of the Tiger reserves need protection from man-eaters. Programmes to improve the lot of families that fell victim to tiger attacks in Sunderban and other areas could be formulated and sponsored . Thank you very much for adding important points to the topic. All the money that goes into marketing and advertising such campaigns could be diverted into practical solutions like the things you have suggested. The other day, some one said, joining the “Save our tigers” campaign on the internet is like playing Farmville to address world food crisis. Royal waste of time, money and efforts. I totally agree and feel the same and wondered about it!! How can poachers blog? and firstly, do they blog? ! 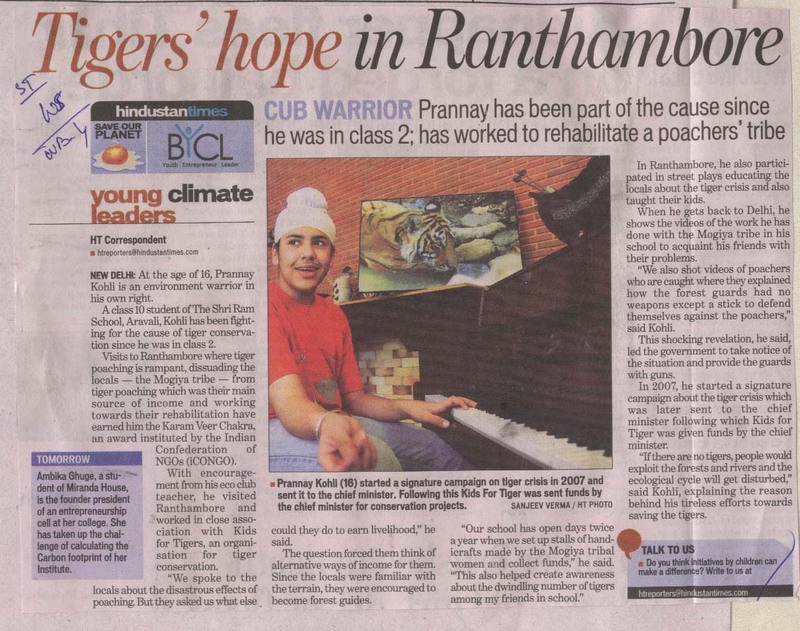 But a recent article in the paper with a proof that a tiger was being left in the jungle to mate was a welcome relief. Hope the message is spread and is not contained in the blogs. The best part about blogging is that we all atleast think of it. Is it not better than not at all speaking of it. Atleast there are some people who read and get goosebumps so lets blog for them. Here I got the answer…any ways nice message anna…loved it…Thanks!!! Hey Chandra !!! you are absolutely correct when you say that how can we as Indians save our tigers by writing blogs and signing up on a website which is nothing but a massive advertising campaign. Its just a hoax and I’m sure this will die off within a few months. Welcome to my bog! Thanks for taking time to leave the comment.